When Drew Goddard made his first film as director, the 2012 horror homage The Cabin In The Woods, a large number of the audiences that saw it – or at least, what few there were – quickly told people not to look up any further details about it online, and to go in as blind as possible. That way, the surprises that the movie would unveil would be all the more shocking and, indeed, surprising. I used this tactic for Goddard’s second film as director, the pulpy mini-epic Bad Times At The El Royale, especially after I started reading reviews that warned people against reading any further plot details, because again there was always the chance that the surprises this time round would once again be ruined by morbid curiosity. In that regard, my manoeuvre paid off for the most part; I did find myself very surprised by a lot of what goes down in this film, and I did enjoy a good chunk of it, though I will admit I was expecting something a bit more off-the-rails than what it ended up being, which again wasn’t bad – in fact, I really had a good time while watching this – but perhaps not as great as I had hoped it would be. 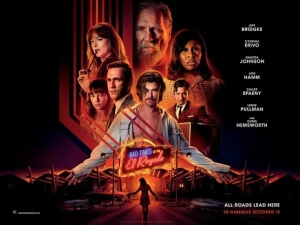 Set in the late 60s, a group of strangers – including Father Flynn (Jeff Bridges), a priest; Darlene Sweet (Cynthia Erivo), an aspiring singer; Seymour Sullivan (Jon Hamm), a vacuum cleaner salesman; and Emily (Dakota Johnson), an anti-social woman – all arrive separately at the El Royale hotel, an establishment built directly along the state border between California and Nevada. The hotel is completely empty apart from these new occupants, as well as a sole concierge named Miles (Lewis Pullman), and when each one of them checks into their rooms, their real intentions are made abundantly clear to us; all of them leading to a number of unexpected and unexpectedly violent run-ins, especially when charismatic cult leader Billy Lee (Chris Hemsworth, channelling both Charles Manson and Negan from The Walking Dead) shows up. It sets itself up at first as an intriguing mystery, as you’re wondering how – and indeed if – all of their stories are somehow connected, or if there is something far more dangerous at play that each one of them has unknowingly stumbled into. You also learn a bit more about the hotel itself, and one of its key secrets that invades guests’ privacy in more ways than one, which all adds to your growing curiosity of what in the actual hell this is all leading towards. Don’t worry, though, for there is plenty of time for that curiosity to grow; at nearly two-and-a-half hours long, this feels like a mini-epic where every major character getting a good amount of story to unfold, with a non-linear narrative that cuts back and forth to several notable events, sometimes even to ones that transpire mere seconds before the previous scene concludes. Goddard weaves each and every thread together onto a loose but consistent canvas, revealing surprising facts about the backstories of some of these characters in a script that gives each and every member of its incredible ensemble cast – from the always-reliable Jeff Bridges and Jon Hamm to growing favourites like Dakota Johnson and Chris Hemsworth to lesser-known figures like Lewis Pullman and especially Cynthia Erivo – enough meat to chew on for that extended running time. He’s also gained a few strong abilities as a director, often adding tension to many scenes which are all executed in one long continuous take, and some impressive production design that gives the hotel lobby a bit of characterisation of its own. While the running time is ambitious for a film like this, and for the most part it pays off, it does also lead to one of the film’s biggest problems, and that’s how sometimes it can have a few pacing issues. Certain scenes will go on for a little while longer than it really needs to, especially when it gets nearer the conclusion, during which something really intense and dramatic will be going on and then out of nowhere it will cut to a completely different and up until then unexplained flashback involving a major character, stopping the film dead in its tracks whilst doing so. There are also characters who end up being not that necessary to the overall plot, and when you see how their particular story comes to a conclusion after many minutes of being set up, you’ll not only be disappointed that this certain person is not in the movie anymore after that, but also that nearly everything they did all added up to really not that much in the end, rendering their entire role in the movie somewhat pointless. That being said, their demise is wholly unexpected, as are a certain few others which really make the film unpredictable and leave you fearing for every other character in the scenario, because you have no idea if any of them are going to get out of this alive, if at all. The violence in this movie can also be very sudden and take you completely by surprise; there’s one particular blow that comes completely out of left-field, almost serving as a kind of jump-scare which actually works because there’s no way in hell you would have been able to see it coming even if you tried. Because there was a strong mystery element as well as a sense that any one of these people could meet their maker at any given moment, I was thoroughly entertained by a lot of this movie, even though I do admit that the film as a whole is not perfect. I was genuinely having fun with these very talented performers bouncing off of one another with the quips that Goddard provides them, and how everything unfolds in ways that even I wasn’t expecting. It’s a movie worth checking into, but not without a cautious look at what people have put on TripAdvisor beforehand. Bad Times At The El Royale is a pulpy and entertaining mystery thriller with a great ensemble cast and strong production values, though its genuinely epic feel and lengthened running time can often lead to pacing issues that prevent it from being truly great.